Now, I use fortified wines all the time in the form of the many variations of vermouth, but for this challenge I wanted to go with an ingredient that I didn’t normally use (and vermouth has had its own Mixology Monday in the past). It so happened that I had a bottle of Madeira that I was saving for cocktail exploration at some point so this was a great opportunity to open it up. Generally I don’t use things like Port, Madeira or Sherry just because they, like vermouths and other fortified wines, require you use them within a short amount of time before they turn. Yes, they do keep a while — that was the whole point — but they don’t keep for months and months (please don’t leave vermouth out in your bar for a year; throw it out, I beg you). I only have so much room in my refrigerator I can use before my wife files divorce papers, so I have gone with the more easily mixed vermouths than with something like Madeira. Garnish with an orange twist and 3 drops of salt water. Madeira offers a spicy nuttiness that I thought paired well with a blended Scotch (I used Famous Grouse) and the sweet nuttiness of Amaro Nonino. There’s a spiciness to Angostura as well, so this added to the depth and the bitter note pulled everything together for me. The orange garnish added nicely to the nose of the cocktail, and the salt water was a last minute addition I made after the first couple of sips. I felt it brought out the spices all the more. The name derives first, probably obviously, from the Scotch component. The “Heir” is a hat tip to Henry the Navigator, the man who discovered the Madeira Islands, who was Infante (great name for a cocktail, but, alas, already taken), or heir to the king. Or at least Wikipedia tells me so. I did have quite a few other attempts at pulling Maderia into a drink, most admittedly not successful. I found that either the Madeira didn’t play well with other flavors, or else I masked it so much that it defeated the purpose. I felt The Kilted Heir did a fine job of highlighting the Madeira while still creating a unified drink. Some others that I did enjoy I list here for sake of recordkeeping. Basically a Negroni using Old Monk and Cynar, with Madeira added into the mix. 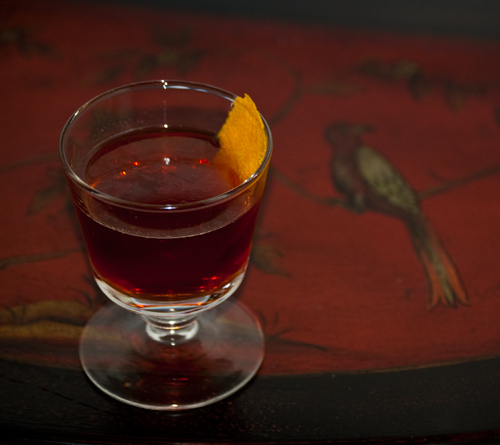 The Old Monk, one of my favorite bases to mix with, could hold its own against the Madeira with its spiciness. It was good, but not terribly original, which is why I did not feature it. The name obviously comes from the pronunciation in the Mel Brooks movie Young Frankenstein, the musical adaptation of which I was just cast in when I made the drink. Can’t wait to get started on those themed drinks! This was a minor variation of The Kilted Heir. I wanted to try a Cognac base instead. Another drinkable concoction, but I felt the Scotch base led to a more robust drink. In forte we have a word derived from French that in its “strong point” sense has no entirely satisfactory pronunciation. Usage writers have denigrated \ˈfȯr-ˌtā\ and \ˈfȯr-tē\ because they reflect the influence of the Italian-derived forte. Their recommended pronunciation \ˈfȯrt\, however, does not exactly reflect French either: the French would write the word le fort and would pronounce it more similar to English for. So you can take your choice, knowing that someone somewhere will dislike whichever variant you choose. Ah, c’est la vie (pronounced “kest la vye”). Excellent! I almost want to change the name to match. Fortified wines that have already oxidized – like madeira, oloroso sherry, or tawny port – will actually last for a good while unrefrigerated. They will last longer in the fridge, but they’re a lot less delicate than vermouth. You might have saved my marriage. So how long would you recommend? I have read varied accounts from a few days to 7-8 months. I’d love to have these around to play with more, if the quality remained — Madeira was a lot of fun to experiment with. A bottles of oloroso sherry have lasted a year plus in my fridge, so I figure they’re safe for at least a few months outside. Madeira should be even safer, because of it being heated during the aging process. I know a madeira rep who told me that she had left bottles on the counter for over a year after opening them and they were still good. Additionally, a lot of decent fortified wines are still not terribly expensive, so if a chunk of a $10 bottle goes bad, at least you’re not out too much. You should definitely whip mine up and tell me what you think! I’ve been making it for myself for years. I’d love to try the Kilted Heir, but I don’t have any amari, and I never keep any around, other than Campari and Fernet. Any suggestions on subs for that Nonino? Isn’t Nonino one of the ones that’s not very bitter? Yes, I noticed that! Great minds, no? I will definitely be trying that with my next bottle of Madeira and will let you know how it turns out. I personally love amari and keep a fair number around. You are right that Nonino is on the sweeter side, though there is a bitter component — just certainly not as dominant as in Compari or Fernet. I think you could use something that Averna or Meletti equally well. And, if you are looking for amari-free, I’ve never really tried a substitute, but you could probably do something like what you did with Later That Day, adding maybe a 1/4 oz. of simple syrup and then really upping the Angostura, perhaps 1/8 oz. I might have to give it a try and see how it compares.